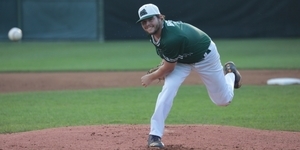 Alec Burleson pitched five shutout innings before knocking in three runs of his own, propelling Big Train to its 12th win. Behind five shutout innings on the mound and a three-run shot from the plate by Alec Burleson (East Carolina), Big Train (12-2) defeated the visiting FCA Braves (9-5), 6-2. After the first half of what was scheduled to be a doubleheader at Povich Field was cancelled, the two teams took to the field for a single contest on Saturday night. The first half of the game moved at a rapid pace and was mostly dominated by the teams’ starting pitching. Alec Burleson allowed three hits and struck out four, while the Braves’ starter, Brett Kreyer, allowed just two hits over the first five frames. “I thought I was a little shaky in the first couple innings, but I settled in and did what the team needed me to do,” Burleson said. Catcher Jacob Southern (Jacksonville) put Bethesda ahead in the sixth with a monstrous solo home run that soared well over the left field fence. In the seventh, with Burleson continuing to bat as a designated hitter after being relieved of his pitching duties, Big Train loaded the bases with one out, only to leave all three runners stranded. Third baseman Carson Taylor (Virginia Tech) completed Big Train’s scoring with a two-run home run later that inning. The Braves nabbed two runs off of McCarvel in the ninth, but it wasn’t enough to keep Bethesda from extending its division lead over the Braves to three games. Bethesda is now a perfect 6-0 in games at Shirley Povich Field this season and possesses a 14-game home winning streak dating back to last year. They will take to the road on Sunday when they visit the Gaithersburg Giants before returning to Bethesda on Monday to face the Silver Spring-Takoma Thunderbolts.